Josephus Hubertus (Jozef) Tonnaer was born in Thorn in Limburg on the 7th of March 1852. 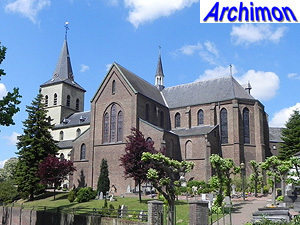 He was educated at the Cuypers office in Roermond, working for J.Th.J. Cuypers. One of his earliest works as an architect appears to be the overhaul of a villa in Deurne (NB) in 1881, where Tonnaer probably lived at that time. In the years 1884-1886 he worked for the Cuypers firm again, as an overseer at the construction of P.J.H. 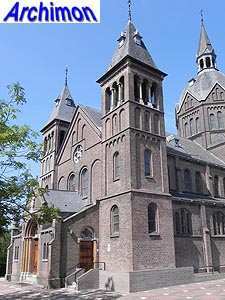 Cuypers' church of St. Hippolytus in Delft, while living in Amsterdam at least in 1886. 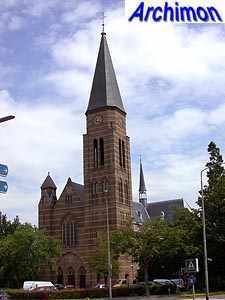 Shortly thereafter he moved to Delft, where he lived at four different adresses, the last of which was right across the St. Hippolytus, and was a member of the city counsil before moving to Den Haag in August 1905. Tonnaer spent the last years of his life in Sassenheim. Tonnaer worked as an architect as well as a religious artist, but also designed several profane buildings, although often these assignments came from clients of a catholic religious nature. 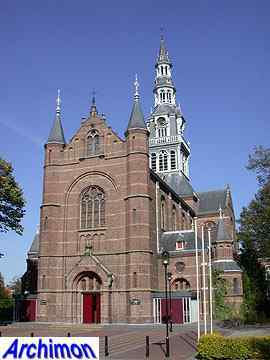 His first church was the St. Laurentius in Heemskerk, in an unusual, at least for a catholic church, neo-Renaissance style. His other churches are all in a more traditional neo-Gothic or neo-Romanesque style. Possibly due to contacts in his region of birth, Tonnaer had a few assignments in his native province of Limburg as well as just across the border in Belgium. Tonnaer possibly had a son, architect A.J.E. Tonnaer, who died in Sassenheim in 1926 at the age of 36. J.H. Tonnaer died in an old people's home in Sassenheim, designed by himself, on the 20th of March, 1929. The following is a list of his religious buildings only and is probably incomplete. Three-aisled pseudo-basilica in neo-Gothic style. Renovation and enlargement of an older church. Cruciform basilica in neo-Romanesque style, with two frontal towers and a large domed crossing-tower. Three-aisled basilica in neo-Gothic style, incorporating a Romanesque tower. Cruciform basilica in neo-Gothic style. Extension of an older church, built out of a marl, with a new transept and choir built of brick. Cruciform basilica in neo-Gothic style. The choir and transept were built in 1913, the nave and tower were added in 1928-1929. Cruciform basilica in neo-Romanesque style, with tower at the front and large polygonal crossing-tower. Demolished in 1964 due to damage caused by mining. Chapel for the old people's home where Tonnaer died three years later. Demolished in 1971.